Blowout Sale! 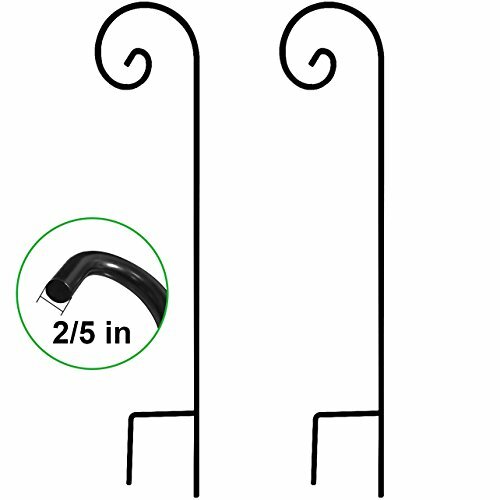 Save 51% on the Shepherd Hook 48 inch 2 Pack 2/5 inch Thick Heavy Duty Rust Resistant Garden Outdoor Hanging Plants Basket Hanger Pathway Light Solar Lantern Mason Jar Wind Chimes Wedding Black by BEAU JARDIN at Tulips Orchids. MPN: SH48x2. Hurry! Limited time offer. Offer valid only while supplies last. Beau Jardin offer 35inch,48inch,65inch long shepherd hook,This set includes 2 pack 48 Inches tall,0.4 inch thick heavy duty shepherd hooks. Beau Jardin offer 35inch,48inch,65inch long shepherd hook,This set includes 2 pack 48 Inches tall,0.4 inch thick heavy duty shepherd hooks.